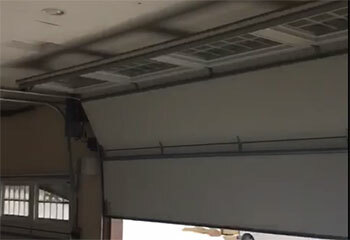 If you're looking for a professional garage door service, we're the team for you. If you want examples of our work, take a look at some of the latest projects we completed. 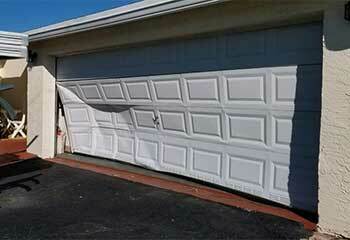 Customer Issue: The door failed to stop closing and it hit the customer’s car, damaging both. Our Solution: Step one was to replace the lower panel of the door that had been damaged. 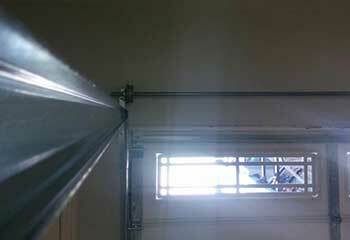 Next, our team tested the optic sensors, lift cables, and the opener. They determined that the opener’s emergency reverse feature was compromised due to loose components and detached wires, and repaired the problem by reconnecting them and replacing a few. Customer Issue: Door slams to the floor. Our Solution: We began by inspecting the springs, and quickly discovered that their tension was very loose. We proceeded to adjust the springs and then tried the door again to make sure it was able to close evenly and without hitting the floor. Our Solution: We loosened all the screws and fasteners and removed the ruined track, and then proceeded to install a new one in its place. We made sure both tracks were properly aligned and then opearted the door a few times to make sure it was able to open and close smoothly. Our Solution: We asked the customer a few questions to establish what their needs were. 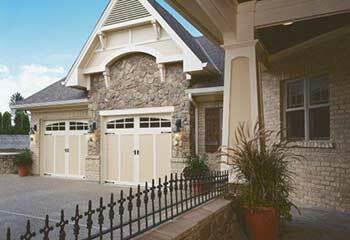 We then recommended they get an AP200 Steel Garage Door by Raynor, which is the flagship model of their Aspen series, known for its insulation qualities, durability and elegance. We installed the new door at the customer's new home and made sure he was completely satisfied with our work.